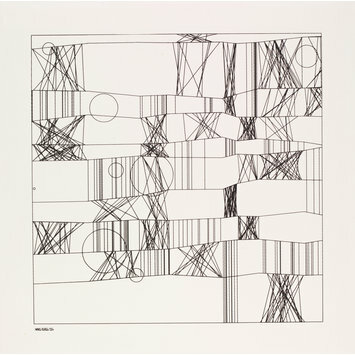 This screenprint was created from a plotter drawing produced using a computer program, or algorithm, written by the artist Frieder Nake (born 1938, Germany). It is based on a painting by Paul Klee, entitled 'High Roads and Byroads', 1929, now in the Ludwig Museum, Cologne. Nake took Klee's exploration of proportion and the relationship between the vertical and horizontal lines of the painting as the starting point for his algorithm. Nake then generated the drawing using a pen plotter. A plotter is a mechanical device that holds a pen or brush and is linked to a computer that controls its movements. Nake was able to set the parameters of the drawing to dictate the horizontal and vertical framework. By deliberately writing random variables into the process, Nake also allowed the computer to make certain choices within a given number of options. At this time, computers would have had no screen on which the image could be visualised. Nake underpinned the foundations of his image making with a mathematical logic. 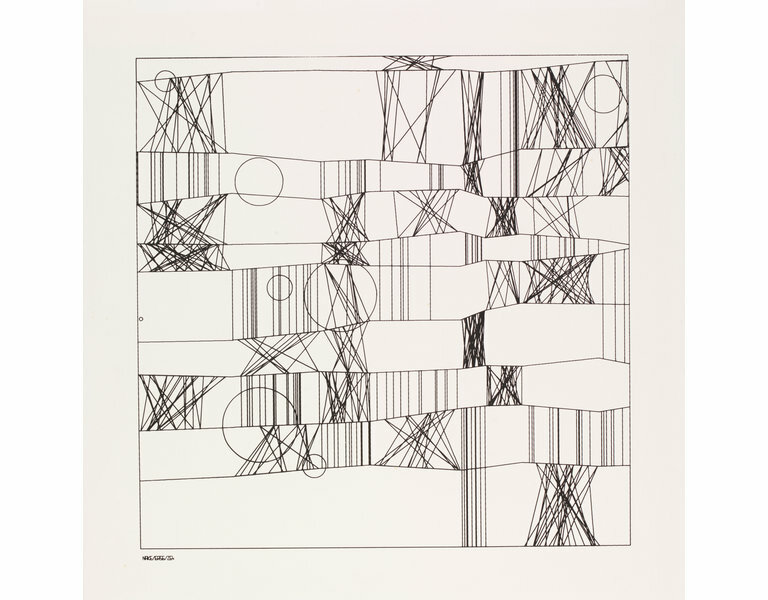 In so doing, the artist demonstrates the impact of Max Bense's theories of Information Aesthetics that considered a more scientific approach to the study of aesthetics, and which heavily influenced many of the early computer art practitioners. Screenprint on paper, from a computer-generated drawing. Screenprint from a plotter drawing, 'Hommage à Paul Klee', 1965, by Frieder Nake. Herzogenrath, Wulf and Nierhoff-Wielk, Barbara, eds. Ex-Machina-Frühe Computergrafik bis 1979. Munich: Deutscher Kunstverlag, 2007. ISBN 978-3-422-06689-2. p.425 (cat. 263), ill.